Majd Lahham, a resident of Damascus, agreed to a long distance interview with Levant Report this week. He is a member of the Antiochian Orthodox Church headquartered in Damascus and spent years as head of the program for Iraqi refugees in the Office of Ecumenical Relations for the Patriarchate of Antioch, and as local coordinator for International Orthodox Christian Charities. As the conflict in Syria spread in 2011, he increasingly became involved in relief work for internally displaced Syrian refugees. In the Fall of 2012, Majd toured multiple cities throughout United States as part of the Presbyterian Peacemaking Program. He attempted to raise awareness among Americans of the plight of Syria’s two million strong Christian community, and shared his experiences of working with Iraqis and displaced Syrians. Sadly, the plight of Syria’s Christians is an issue that is still largely ignored in mainstream press, and by most Americans. Majd currently teaches at a private college in the Damascus area. His views should not be taken to express the official opinion of the Orthodox Church of Antioch. He speaks as private Syrian citizen. LR (Levant Report): Thank you for your willingness to do this interview during a busy time. We understand that you maintain a full teaching schedule at a private college in the Damascus area – this is refreshing to hear about as it is a sign of normalcy and stability in the city. What is daily life like in Damascus right now? M. Lahham: It is a very difficult life. Lots of necessary items are not available. Prices have sharply increased. What were once essential food items for families are now considered luxuries. For example, the price of one egg before the crisis was 5 Syrian pounds and now it is 30 Syrian pounds (in the U.S. this would be like a simple carton of eggs suddenly costing close to $15). If you want to go to your work, you have to cross at least three checkpoints. You will never know if you will come back home or you will be killed by a mortar or by a suicide bombing. Usually we lose electricity for 6 hours a day. However, if a terrorist bombs a fuel line, we lose the electricity for almost one day until the lines get repaired by the government. 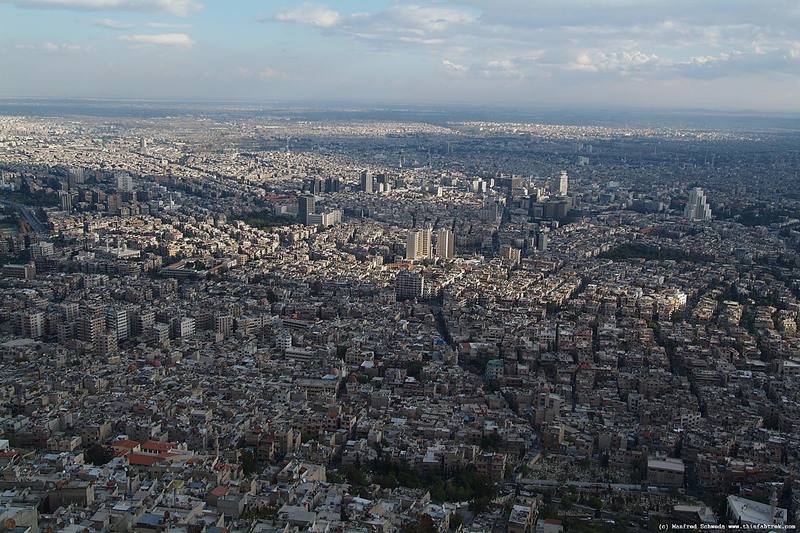 It is dangerous to travel outside the city of Damascus. Sanctions by the United States and Europe have made daily life even worse. Ten thousands of people are now starving. They eat only bread and some vegetables. Some people who are now under siege by rebel groups are out of food and they are boiling available spices like cinnamon to maintain even a little energy. LR: Western media gave little attention to the rebel shelling of the Christian school in Qassaa on November 12, which killed multiple children and wounded many more. Have the rebels continued their attacks on the Christian districts of Damascus since November? What is the situation for Christians near the Old City? M. Lahham: Yes, on daily basis. For instance, yesterday (Feb.12) a mortar shell hit the Bab Touma area near the Armenian church. The Christians living near the old city of Damascus are protected by the government. They can go to work and study etc… But the mortars are still a major problem. I think the one million dollar question is this: why are Christians being targeted in all Syrian cities and villages in an organized way by the so-called “rebels”? We are a minority. We do not have any militia. We have a good historical relationship with all Muslims. There are even statements by their Prophet Muhammad that say that Christians have to be respected. I think what is going now is an attempt to create a new Sykes-Picot Agreement and create new, smaller ethnic countries where there will be no place for Christians. LR: We are all hoping and praying for the release of the nuns, but what can you tell us about the general situation in Maaloula right now? Have any Christian residents been able to return to their homes, or do terrorists still control the village? M. Lahham: Unfortunately, the situation is bad in Maaloula. The rebels control this area. Our Christian heritage has been destroyed. Graves have been desecrated and icons were stolen or burned. The Christian people of Maaloula are now in Damascus with no money or property. LR: What can you tell us about the situation in Saidnaya right now? M. Lahham: Saidnaya finds itself in a different situation than Maaloula. The people in Saidnaya decided to defend themselves. They carried weapons and created a local group to protect Saidnaya. Surprisingly, those armed people are made up of simple workers and employees. They work every day in Damascus and then return to Saidnaya in the afternoons and evenings, whereupon they work in shifts to protect the village. I have a friend from Saidnaya who is working as a driver; he couldn’t pick me up because he had a shift in Cherubim Mountain at that time. Two weeks ago, hundreds of rebels from Yabroud (the village where the nuns are being held hostage now) tried to occupy Saidnaya, but the Christians successfully protected their village. Now, Saidnaya is considered a “holy castle.” All people are afraid of a second attack and the rebels have been defeated there and are trying anything to win. After the battle, the rebels shelled the village for almost one week just to prove that they are strong. LR: You spent many years directing the program for Iraqi refugees under the Orthodox Patriarchate’s Ecumenical Relations office. We understand that there are over one million Iraqi refugees in Greater Damascus, all displaced after the U.S. invasion of Iraq. What can you tell us about the general plight of Iraqis in Damascus? M. Lahham: The number of Iraqi refugees has sharply decreased. We still have Iraqis – especially those Christians who escaped sectarian violence in Iraq. Their situation is also bad. They are waiting for being resettled in the United States or any European country. LR: President Obama, multiple congressmen, and mainstream American media, have all consistently presented the U.S. position on the Syria conflict as one of desiring “democracy and freedom”… American foreign policy claims to have the best interest of Syrians at heart. What are your thoughts on this? M. Lahham: With all due respect to American people, we do not believe in Mr. Obama’s intentions. If you live in Syria, you are able understand the whole picture. The problem is not whether we have democracy or not. This is a clash between Russia and the United States – and the battlefield is Syria. Even worse, Iran, China, Saudi Arabia, and Qatar are also players in the game. We do believe that when the Americans and the Russians reach any possible agreement about the investment of gas and oil in the Middle East region, and especially in the coastal area, everything will be solved. Mr. Kerry, the U.S. secretary of foreign affairs announced that Congress approved of providing the rebels with lethal weapons during Geneva II Convention. It is clearly evident that this American administration does not want to work in the interest of the Syrian people. And I would add the following: I think the American administration is not working in the best interest of the American people as well. They work in the best interest of the “imperial businessmen” in the oil and weapons industries. 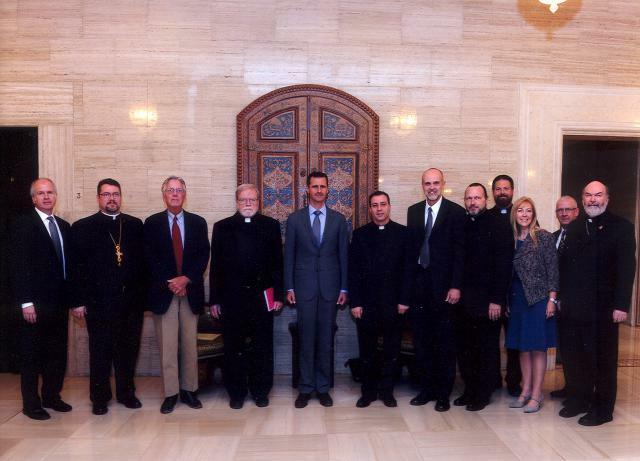 Christian delegation to Damascus meets with President Assad of Syria in September 2011. Fr. Joseph Huneycutt stands third from Assad’s left. Photo credit: antiochian.org, Used with permission. Levant Report: Thank you for agreeing to talk to us about the Christian situation in Syria. Last December, your parish, St. Joseph Orthodox church, hosted a benefit concert for the Syrian humanitarian crisis. What prompted you to put together such an event and how did the community respond? Fr. Joseph: The event came together thanks to the dream of St Joseph parishioner Lama Nashawati DeVries, a classically trained professional pianist, along with her brother Deacon George (Bassam) Nashawati, a violinist for the San Antonio Symphony. They teamed up with other Houston area performers, both within and without the parish: Christine Yacoub, Len Verrett, Mariam Haddad, Osama Raad, Tracey Parker, Dr Bill Attra and the St Romanos Chorale, and pulled together a special night of entertainment: “Hope, Humanity, Healing – A Musical Offering to Syria.” It was standing room only in the parish hall; around 250 people came out to enjoy the show and support the cause. The event raised $18,000 of which the Diocese of Bosra-Hauran, Jabal al-Arab, and the Golan in southern Syria, and the St Gregory Orthodox Society for the Elderly and Orphans in Damascus were the beneficiaries. Thanks God, it was a very special evening in support of our brothers and sisters in Syria. LR: The sister diocese to your own (the Antiochian Diocese of Wichita and Mid-America), is the Archdiocese of Bosra-Hauran in southern Syrian. While the destruction of churches and persecution of Christians is well documented in northern Syria, we haven’t heard much out of southern Syria. What do you know of the current Christian situation in southern Syria? Fr. Joseph: What I can tell you is, though the Christian presence in southern Syria has diminished, the charitable support of refugees continues; those who remain live in danger every moment. It will take heroic hard work to rebuild – the land and the people – once this war comes to an end. LR: During September 2011 you were part of a delegation of priests and pastors that traveled to Syria for the express purpose of investigating the political crisis, especially as it impacted the Syrian Christian community. Fr. Patrick Henry Reardon’s final report was generally critical of mainstream reporting of the Syria conflict at that time in American media. The report suggested that the narrative of a mass democratic uprising was flawed, and that there was a dangerous, extremist element within the opposition committing assassinations and terrorist acts. Now, two-and-a-half years after your trip, what is your assessment? Do you think Fr. Patrick’s characterization has been born out? Fr. Joseph: I believe Fr Patrick’s characterization of the situation as we witnessed it in 2011 was accurate. For example, one night I came back to the hotel and signed on to America Online. The news on AOL said: “Bloodiest Day Yet in Damascus” – it featured a video of a mass demonstration; gunshots could be heard. Later, I turned on the TV and saw that certain news channels were reporting the same and showing footage of other massive demonstrations in Damascus. These networks, like AOL, were not local to the Syrian situation. Our group had traveled all over Damascus that day. Granted, Damascus is a big city – but our experience on that day, singled out by the foreign news media, could not have been more different. We saw no signs of unrest or demonstration, but did see families picnicking on the side of the road, shoppers going about their business, etc. While speaking in Canada and the northeastern US in the months following the 2011 trip, I reported what I had actually seen and heard while in Syria. Invariably my words were met with suspect curiosity, even disbelief, based on what my hearers had witnessed on American television. Ironically, I sounded like a propagandist! LR: What was the most surprising or unexpected discovery for you personally while serving on this delegation to Syria? Fr. Joseph: The gracious hospitality of the Syrian people never ceases to amaze! It was also surprising to witness, with my own eyes, the extent to which televised media actually makes news (rather than just reporting) which shapes public opinion and governmental policy. LR: While major Middle East media outlets like Lebanon’s The Daily Star covered the 2011 Christian delegation to Syria, there was not much notice of it at all in mainstream American press, other than some local and church news sources. Did you feel that you were ignored? Why do you think there wasn’t much notice of this historic trip, which even included a high level meeting and interview with President Assad himself? Fr. Joseph: I traveled with the 2011 Syrian delegation because I was invited by his Eminence, Metropolitan Philip (Saliba); the intent was for us to witness the state of the Christians there. Other than fear, given the news, I had no expectations of self, motive, media, or anything else. We had almost two hours with President Assad, just our delegation and an interpreter; he addressed all of our questions and concerns, even those critical of himself, without hesitation. Much of what he said has proven to be as he said; time will tell. Perhaps our visit served merely as an encouragement to the Syrian faithful. May God preserve them! As a side note, a funny story: My non-Orthodox mom called a few months after our trip to report that our delegation, pictured with President Assad, was shown on some protestant TV program. They were doing a story about how, in the midst of war, missionaries are bringing the Christian faith to Syria! Fr. Joseph: My heart truly grieves for Syria. I have been twice, having spent only a few weeks of my life there, but those days are unforgettable. The unimaginable days which the Syrians now endure will eventually pass. But for those who endure them, these days will be conversely unforgettable. I hope American Christians do not believe that this is a war of Syrian Muslims against Syrian Christians – nor even a war between native Syrians. Pray for the Syrian people! They are suffering a horrible war which is fueled from many sides whose varied interests are not, primarily, Syria or religious. Americans are used to opening their purse during such calamities. But, donors need first to find out proper, prudent and safe channels for monetary donations. That Syrian Christian presence, as old as the Faith itself, is made up of people who may soon make their way into our midst. May God help us to learn from the long-suffering Syrian people their longstanding ministry of hospitality. Last Thursday (4/3/14) freelance Middle East journalist Sara Elizabeth Williams broke the story of a CIA/US Military run training camp for Syrian rebels in the Jordanian desert. VICE UK ran her investigative story, “I Learned to Fight Like an American at the FSA Training Camp in Jordan,” which international Syria experts thought hugely significant, yet it got little attention on this side of the Atlantic. Top Syria expert in the US, Joshua Landis, announced on his Twitter account Thursday: “Sara Williams gets the scoop on the top secret FSA Training Camp in Jordan.” This courageous young freelancer revealed, with photos, the ins and outs of this secretive facility. Levant Report: How did you come to realize that this was such an important story to pursue? 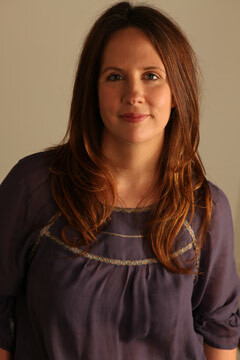 Sara: I think people should know what governments are doing in their name, with their taxes. So when I heard about this covert or less-than-overt US involvement in the Syrian conflict, I thought it was worth pursuing: people – Americans and the rest of us – have a right to know. LR: Were you able to get a glimpse of the actual training base in the Jordanian desert, either through photos, or viewing from afar? Sara: No. I do not know its precise location and I have never attended or seen photos. I have heard a number of rumors pointing to a location, but nothing concrete. LR: Concerning the US military instructors, did your sources identify which branch or group of the military to which the instructors belonged? (Army Special Forces, Marines, contractors perhaps, etc…)? Sara: No he did not. LR: Did you get the impression that once sent back inside Syria, the fighters would have American oversight or legal accountability monitoring their actions on the battlefield? Sara: The fighter I interviewed was aware of no oversight or continued relationship. Other people I have spoken with in Syria, and some articles by leading US and international publications, refer to the US paying salaries to FSA fighters and providing logistical support in an ongoing way, but I do not currently have any knowledge of this. LR: I understand that you are learning Arabic. There are a number of established Middle East correspondents that don’t speak it – why is it important that you learn Arabic? Sara: There are some very talented journalists who can cover a region without speaking the language, and do a marvelous job of it. I commend them. For me, learning Arabic is a priority because it gets me closer to the story: operating through an interpreter can have a distancing effect. And when you understand the language you can soak it in from all sides – interviews, chatter on the street, newspapers, television, demonstrations, all of it. You can also be a lot more nimble: no need to hire a translator (as a freelancer, this is significant!) or pause online chats after every line while you check the meaning. Finally, there’s a sense of cultural understanding that comes from knowing a language. And if you can do it, I think that’s important.